It's fantastic and her card is just beautiful. 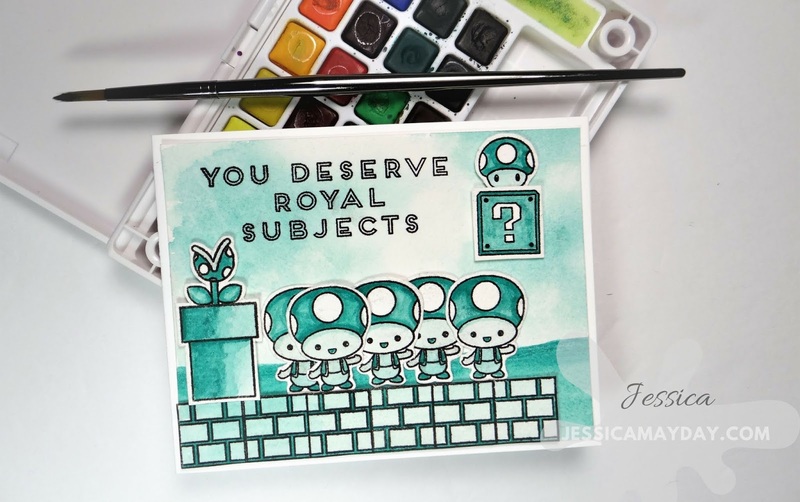 I actually got ready to make a different card using the same stamp set but I was inspired and joined in on the One Color Challenge. I started off with a piece of 140lb Arches Cold Press watercolor paper. 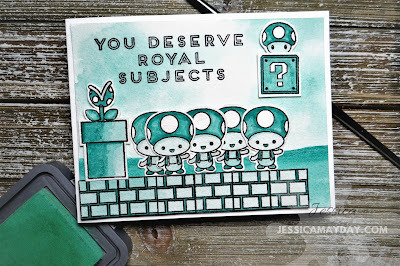 Using my Travel Stamp Platform I stamped all the images I thought I might use (I used all of them!). I stamped the bricks in a row so that I could use them as a floor base. I used Versafine Onyx Black ink because I knew that it would stamp really well on the textured watercolor paper and it's waterproof. I haven't used this ink in a bit and I forgot how long it takes to dry and of course I didn't heat set it. Which I should have and I know that. So there are some smudges but I only see them if I go looking for them. 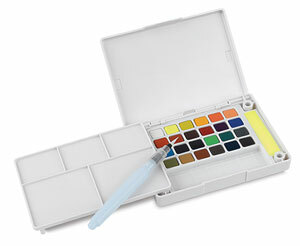 I used my glass media mat to mix the paint thoroughly with water. I tried to go for a medium color first especially with the areas that I knew would be a darker tone. Then added a more concentrated mix of the paint and blended that out with clean water. I kept all the circles on the characters and the question mark in the box untouched by paint so that those points really stood out. Next I painted the background. I did a wash of clean water over the top 2/3 of a new piece of Arches paper. Then dropped in color, moving it slightly around but basically letting it blend and travel on it's own. I soaked up any areas that I thought were to dark with a towel. I heat set that with a heat tool then painted the ground area of the background. I used a very concentrated mix of paint and layered over the bottom 1/3 of the paper. I painted it with a slight curve so that it was not a straight line. 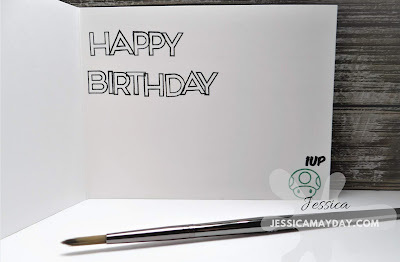 Then I fussy cut the images out using my Fiskars Spring scissors. Once I got those cut out I trimmed down the background 4in. X 5 1/4in. Then I cut strips of Neenah 110lb cardstock that were just scraps I had to layer behind certain images to pop them up. I did this so that there was some dimension to this scene but it isn't as popped up as it would be if I had used foam tape or fun foam. 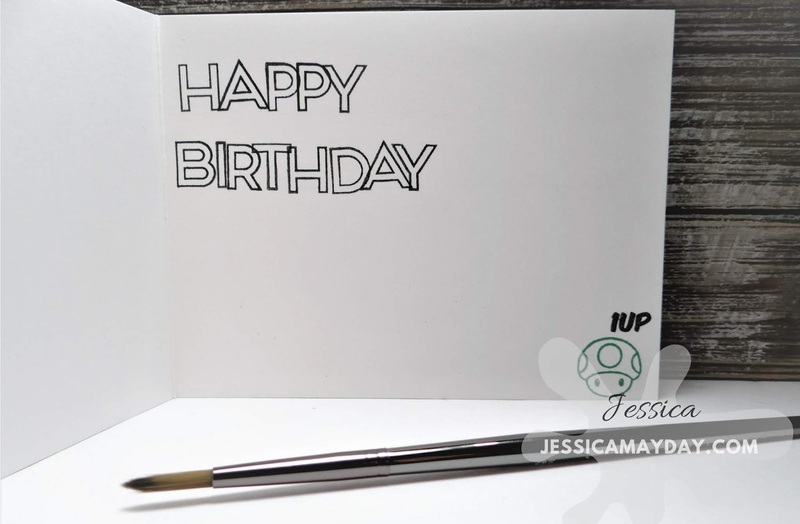 I used 2 layers of the neenah and adhered those behind the pipe, block strip, mushroom and question box. 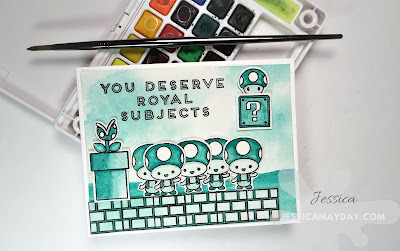 I stamped the sentiment from a Ink Road set in Versafine which I did remember to heat set! Then I put my scene together using my atg gun and multi medium matte glue. 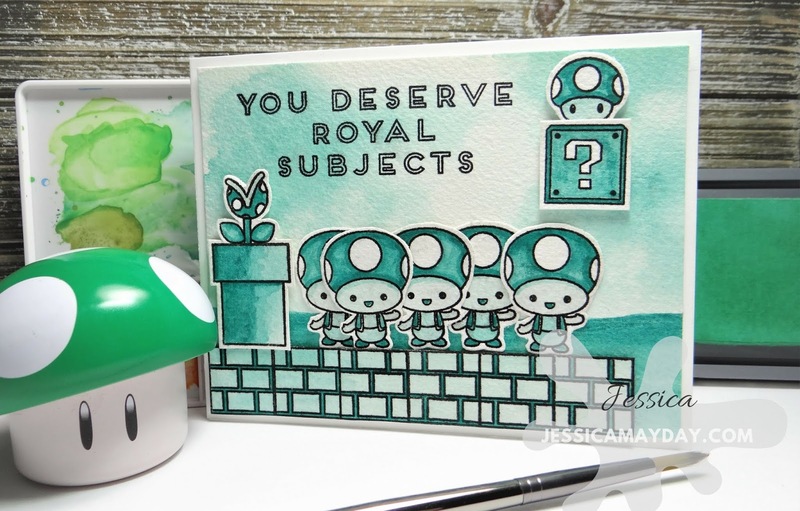 I thought it would be really cute to group all 5 of those Toadstools together. 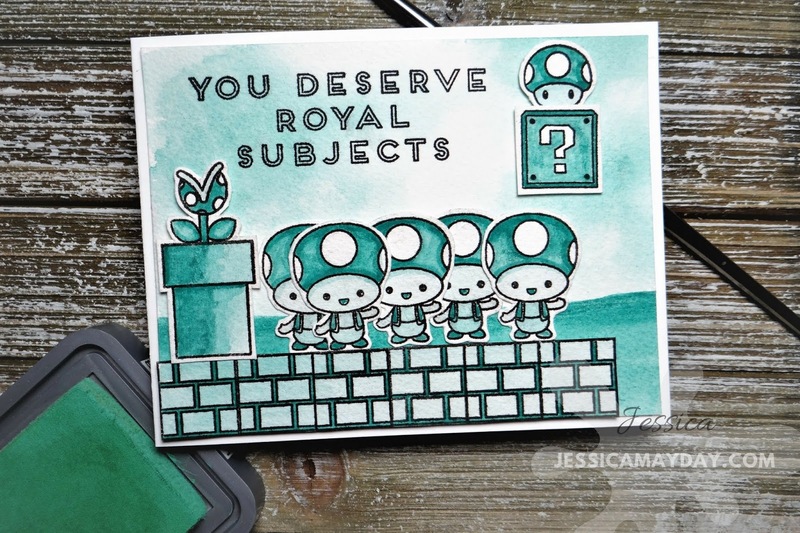 I attached that panel to a A2 cardbase and stamped the sentiment on the inside with another Ink Road stamp set. 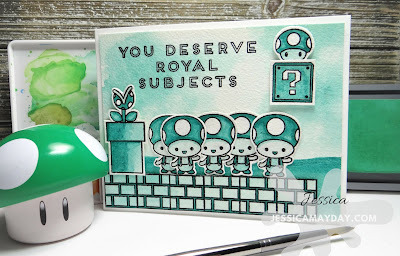 I also stamped the little mushroom on the lower right hand side with lucky clover Distress Oxide ink. I honestly can't wait to create with this Kindred stamp set again.